Chaotic scenes in Dublin as recently defeated boxer Conor McGregor punching an official appears to have been caught on tape. McGregor last fought in a licensed professional boxing match against Floyd Mayweather last August in which he was beaten inside the distance in. His record as a pro boxer is 0-1 but he has not ruled out a return to the professional boxing ring in the future. Since losing to Mayweather in Las Vegas last August, McGregor has been attending different events and functions but was caught up in an incredible incident last night in his native Dublin, Ireland. 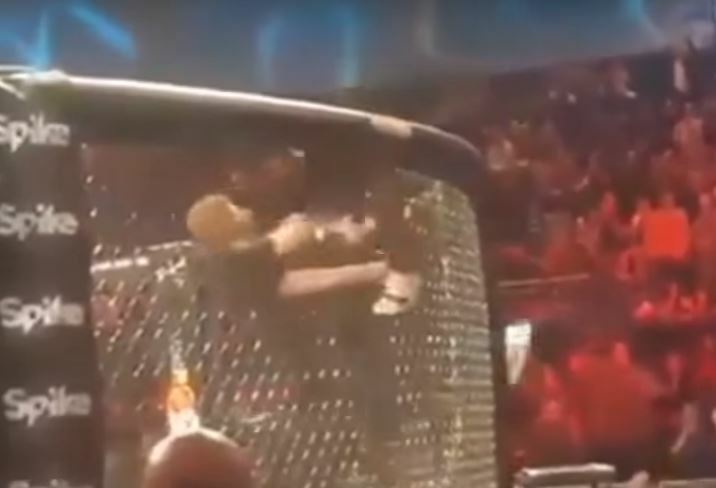 Following an MMA bout finishing where he was seen to storm a cage to offer his congrats to a team mate, he then proceeded to run around the cage and try to enter it once again by climbing up on top of it. It is unclear at this time at what actions McGregor may face following the incident. Since losing to Floyd Mayweather in the boxing ring McGregor has spoken of his desire to rematch him, although Mayweather is officially retired.